Raging bull casino offers players with extensive online casino games and million dollar progressive jackpots. Their bonuses are also hard to pass by. 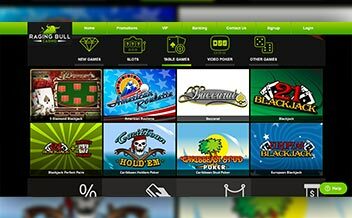 This casino was established in 2014 and runs via real-time gaming (RTG) platform. Raging bull casino ensures players enjoy and have a first class experience when they log in to the site. The casino has amazing progressive jackpots and a wide collection of online casino games. They offer round the clock customer support although their payout speed may sometimes take up to several weeks. They have several methods of payment. 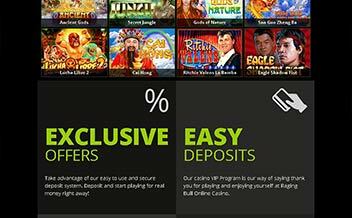 Raging Bull casino has something for both new and current players. There is a welcome bonus of $50 once registration is done. The other bonus one can earn a 200% match bonus up to $400. There is a third bonus where players qualify for 100% not exceeding $200. There is a fourth bonus of 50 % that can go up to $200. Lastly, there is an award of 50 free spins. Raging bull casino offers players with various slots that they will find very interesting. They are powered by RTG. Some of the most favorite slots include enchanted garden, Aladdin’s wishes, white rhino, Cleopatra’s gold, and Aztec riches. Progressive jackpots give players an opportunity to win millions of cash prizes at a go. Players who desire to win big will be excited about the available options. They include God of wealth, eternal love, pirate isle and orc versus elf. 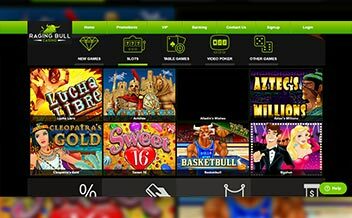 Table games fans will be very happy with Raging Bull casino as they have a diverse collection of these games. You can enjoy these games at the comfort of your home. Some of them include blackjacks, poker, craps, pontoon, keno, sic-bo and many more. Raging bull casino is home to a library of amazing video poker games. If you feel tired by playing slots, video poker is always a good alternative. The games here include all American, Aces and eights, jacks or better, and joker poker just to mention a few. This casino is powered by real-time gaming platform (RTG). This ensures that there is a massive collection of games. Registration at the site is very easy and users will not have a hard time in doing so. Raging bull casino can be accessed on browsers such as opera mini, Mozilla and chrome. The games can also be accessed on tablets and mobile devices. The games are also downloadable. The casino can still be accessed on IOS and Android devices. This review doesn’t recommend this casino as owners have a long history of a bad reputation.